? 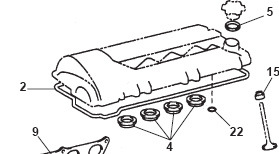 What torque for the valve cover ? My valve cover (and diffuser) will be replaced this coming week by the dealership (b/c of this: https://www.lotustalk.com/forums/showthread.php?t=36512 as even they couldn't get it off) and, given their past service performance issues, I want to make sure that they torque it correctly. Anyone with the engine manual that would be willing to tell me the correct torque? The local Toyota dealer doesn't have the manual in stock and it will not be here until 2 weeks after my trip to have the cover replaced. I know it's 7 ft/lbs for my Civic but that doesn't really help me . Last edited by RoadDad; 12-22-2007 at 06:13 PM. There's not one listed although the O-rings and vent pipe gasket are listed as single use (but not the main cover gasket). 7 ft/lbs from what I could find on the Celica forums for the 2ZZ motor when I pulled mine. Thanks codymac. I know that they have ordered a new main gasket and cover. I've never pulled the cover off of the Lotus but have several times with the Honda. I've always replaced every piece of rubber visible when I have. So they should be replacing the O-rings and vent pipe gasket also? I have a feeling this is going to be an ordeal. Thanks Bill. I didn't even think to look on the Celica forums. 7 ft/lbs sounds in line with what I would have guessed, but I often guess wrong. That's what it looks like - little diamond next to them with a tag stating "NON-reusable part." Apologies as it *is* called out in the torque tables (I only looked through the engine section). Bill is correct. So, if I've got this correct, numbers 4 and 22 need to be replaced with new gaskets? From the Celica manual (note that they call out a torque sequence but it isn't indicated in the drawing - shrug). codymac, as my daughters would say, "you're the bomb." Thank you very much. As usual, another "above and beyond" from a forum member. Apparently the dealer does not have all of the gaskets available but still wants to change the cover. The tech states that one of the gaskets that is NON-REUSABLE part according to the engine manual "is not necessary for the Lotus application when doing the valve cover gasket." Is that possible? Cody is indeed the bomb. Next to me he's the smartest guy I know. So does putting a Toyota engine in a Lotus make the non-reusable gaskets reusable? I stand in xtn's shadow... but mostly because he's a lot taller than me. I couldn't find anything in the Lotus manual or parts book about it. I wouldn't worry about it too much though, especially considering how much trouble you've already been through. I'd probably let 'em go ahead and then just check it for seeping, especially on the header side. I haven't had my cover off though, so I'm talking book knowledge rather than street smarts - I doubt most of the people that painted/polished/coated theirs replaced the gaskets though. It seems to me we're talking about trying to save $20 so we can benefit from a weeping cam cover several thousand miles from now, long after the warranty is up. Tell them to get all the parts and do the job right the first time. It does kind of beg the question: Why'd they need the doco for the torque spec. if they've already got something in hand saying the gasket doesn't need to be replaced? Something doesn't add up - that's for certain. I have come across some shavings in engine oil (https://www.lotustalk.com/forums/f25/...-advice-74504/). I want to remove the valve cover to check if there is any unusual camshaft wear. I am planning on following the instructions in the Celica engine repair manual (RM744U2) – the scans of relevant pages were already posted above in Post 9. I have the following 11 questions I hope could get addressed here. Some of them are kind of pedantic, but resolving things like that gives me more confidence. On Post 7 above, it is suggested in a diagram that Parts 4 be replaced. I did not see that suggested in the manual I have. 1. What are those for – ignition coils? 2. Do those really need to be replaced? If so, does it say that anywhere in the Celica engine repair manual? In the diagram on page EM-17, there is only one bolt shown on the No. 2 Cylinder Head Cover. There are 6 bolts shown on the (No. 1) Cylinder head Cover. 3. Then In Step 9a, which 4 bolts in the picture is the manual referring to? I was expecting the manual in this step to be referring to only 1 bolt on the No 2. Cover, or maybe all 7 on both covers. 4. In Step 9c, are the hoses removed simply by pulling on them or are there any tools expected to be involved? Step 9f talks about 9 bolts but the diagram on page EM-17 shows only 6 and the diagram immediately left of the step shows 10. 5. So how many bolts is it and where are they pictured? Step 9g is about the O-ring. 6. Where is this O-ring in the cover? Just below the oil-filler neck? The diagram on page EM-17 only indicates with symbols that the O-ring and the ventilation pipe gasket need to be replaced. This would mean, as discussed earlier, that replacing the main gasket also (the one pictured below the Cylinder Head Cover on EM-17) is not needed. 7. Are we confident that replacing the main gasket is not needed? Is there cases when it is? Can inspecting it tell? 9. 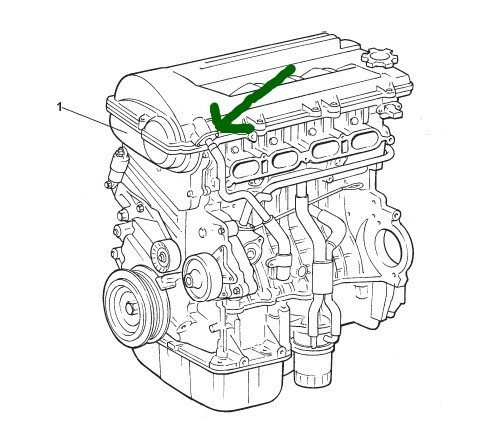 Is this potential need to replace the main gasket applicable in our case (of wanting to remove the valve cover to take a look and then put it back)? I know a good source to get Honda parts (Majestic Honda - The Internet's #1 Honda Automotive Parts Store), which is basically a Honda dealer in RI that offers nice prices over the web (about a 1/4 or 1/3 off). 10. Is there a similar place to get new Toyota parts (at least some discount off the list price)? 11. Where can I get the part numbers for some of those non-reusable seals, like the O-ring and the ventilation pipe gasket? I could show the picture from the manual to the dealer, but is there a better way (more direct way, like web or a manual)? Answers are appreciated. I hope this can also help others too. My valve cover has been removed and replaced three times now with all the original gaskets being reused and it has never leaked. If you inspect the rubber gaskets and O-rings carefully for nicks and distortion or hardening and make sure to keep them clean before reusing them, you should not have a problem. The same goes for the spark plug tube seals. The fiber gasket to the oil breather pipe is the only one I would replace every time, but then again mine has never been a problem. Now in your case RoadDad, because they are replacing the valve cover with a brand new one, you should demand all new gaskets and seals for it. My gaskets and seals were never removed from the cover so they just went back to the same old mating surfaces as before. I can't even imagine how you could drive out the spark plug tube seals from the old cover, install them in the new cover and expect them to be OK. With a new cover, everything will change, so a full set of new gaskets is necessary. Now in your case RoadDad, because they are replacing the valve cover with a brand new one, you should demand all new gaskets and seals for it. I did and they agreed, but that was a long time ago . thank you tesprit, that helps, i now know that i am not going to replace the main gasket, just the two other small pieces. i guess my post 17 was too long to get the response i was expecting. i am going to try to redirect it. when i went to the local toyota dealer parts person, he was unfriendly and not knowledgeable. i had him ask their mechanics for advice, but even they said they never took a valve cover off on a celica (i had to pick a toyota car for them to imagine, otherwise i could get nowhere).